The continued attacks by armed groups in northern Mali have caused a new wave of refugees in Niger. More than 55,000 people crossed the border from Mali in December 2018. Action Against Hunger. The impacts of conflict, climate change, poverty and inequality on hunger are no more apparent than in the Sahel. This large region spanning countries including Mali, Mauritania, Niger and Chad has experienced the greatest increase in hunger of any region in the world, with the number of undernourished people rising by over 13 million in 11 years. This report from Action Against Hunger, Oxfam and Save the Children examines the role that actors across the region and beyond, including national governments, the UN and NGOs can play in improving humanitarian response and supporting development in the region. It reiterates the urgency of strengthening humanitarian and development responses alongside civilian protection, and putting them at the heart of regional priorities. The report highlights the risks of the growing focus on linking security and development, which doesn’t take account of the role that poor governance and inequality play in driving poverty and insecurity. It also sets out clear proposals on what all actors can do to build community resilience and work together more effectively to tackle the complex challenges faced by people in the Sahel. 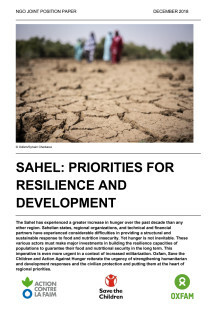 As the situation in the Sahel is increasingly analysed in the light of security and migratory issues by Sahelian governments and the international community, hunger is increasing for the most vulnerable populations, exposed to shocks from the consequences of climate change and conflicts. Far from responding in a sustainable manner to the needs of people, the security response to the Sahelian challenges risks reinforcing the division between rulers and the ruled and increasing tensions. While undeniable progress has been made in the prevention and management of food and nutrition crises in the Sahel over the years, the structural causes of the problem remain too often neglected in favour of a short-term response. 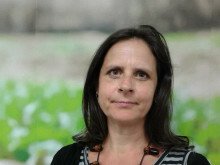 A long-term political vision aimed at strengthening the resilience capacities of vulnerable populations and their adaptation to climate change, particularly by working on a better understanding of the specific needs of women and pastoralist communities, is struggling to become a reality in action, despite the beginnings of initiatives in this area. Breaking the cycle of hunger requires tackling structural factors, such as reducing poverty but also reducing inequalities. This can only be achieved through improved governance and the adoption of a holistic vision, which far from being able to deal with the consequences of climate change, can certainly reduce its impacts. Oxfam, Save the Children and Action Against Hunger are calling on regional policy makers and donors to operationalise a shift in the approach to food and nutrition crisis management and to prioritise this to ensure that humanitarian and development issues do not come second against security challenges. Action Against Hunger, Oxfam and Save the Children reiterate the urgency of strengthening humanitarian and development responses and the civilian protection and putting them at the heart of regional priorities.